CBI - China: Day 129 of 142 of the 1st Battle of Hebei. MTO: Mussolini disbands his Blackshirt legions in Italy. East Africa: Italy conquers Abyssinia (Ethiopia) as King Haile Selassie flees the country. Mussolini forms the colony of Italian East Africa by combining Abyssinia, Eritrea, and Italian Somaliland. CBI: Chiang Kai-Shek proclaims that Japan is waging war in China without any declaration of war. Spain: Day 297 of 985 of the Spanish Civil War. Czechoslovakia: Konrad Henlein, the Leader of the Sudeten Nazi Party, cuts off communications with the Czechoslovakian government. Spain: Day 662 of 985 of the Spanish Civil War. CBI - China: Day 307 of 2,987 of the 2nd Sino-Japanese War. Day 92 of 124 of the Battle of Henan. Switzerland: Spain leaves the League of Nations. CBI - China: Day 672 of 2,987 of the 2nd Sino-Japanese War. Day 54 of 54 of the Battle of Nanchang. The Chinese leadership calls off their siege and withdraws their troops. Day 20 of 35 of the Battle of Suizao. Atlantic - Iceland: British launch Operation Fork, to invade and occupy Iceland to prevent Germany from being able to do so. Meeting no resistance, Royal Marines move quickly to disable communication networks, arrest German citizens and to secure landing areas against the possibility of a German counterattack. Iceland will remain occupied until the end of the war. UK: British Prime Minister Neville Chamberlain begins to discuss the possibility of giving his resignation with Lord Halifax and Winston Churchill. UK: The maximum age for conscription in the United Kingdom is raised to 36. Atlantic: A Royal Navy fleet is attacked by German torpedo boats in the Baltic between Sweden and Germany. The destroyer HMS KELLY, with Lord Mountbatten aboard, is hit but is able to get towed out of there. 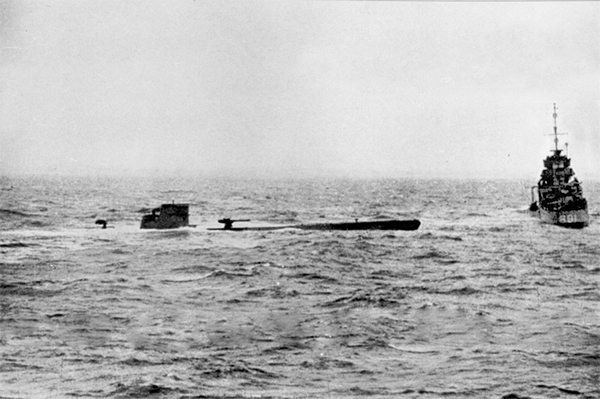 Atlantic: German sub U-9 sinks the French submarine DORIS 40 miles off of the Dutch coast. ETO - Norway: Day 31 of 63 of the Battle of Norway. Four Polish battalions arrive at Narvik. ETO - France: Hitler orders Operation YELLOW, his X-Day invasion of France and the Low Countries, to begin at exactly 5:35 AM tomorrow morning. CBI - China: Day 1,038 of 2,987 of the 2nd Sino-Japanese War. Day 177 of 381 of the Battle of South Guangxi. Day 9 of 49 of the Battle of Yichang. Atlantic: German subs U-110 and U-201 sink 3 British freighters. Afterward, U-110 is forced to surface by British depth charges and is shelled by British destroyers. 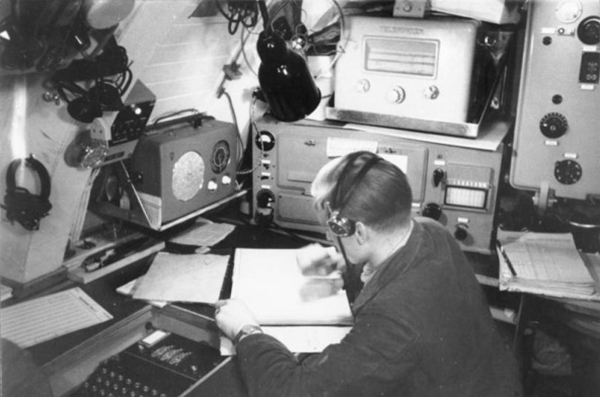 The HMS BULLDOG then captures the sub and seizes intact its valuable Enigma coding machine and code book. The Enigma machine, invented by German engineer Arthur Scherbius at the end of World War I, used a rather ingenious array of electro-mechanical rotors to encrypt and decrypt secret messages. Early models were used commercially from the early 1920s and were adopted by military and government services of several countries, most notably by Nazi Germany before and during World War II. The Germans thought their Enigma-coded messages were unbreakable and were quite shocked at the end of the war to hear that the Allies had been reading most of their messages almost as quickly as they were sent, thanks to the efforts of codebreakers at Bletchley Park, code-named ULTRA. Winston Churchill told Britain's King George VI after World War II, "It was thanks to ULTRA that we won the war." The Wireless Telegraph area on board U-124 in Mar 41, where the Enigma machine can be seen bottom left. Atlantic: German sub U-103 sinks British ship CITY OF WINCHESTER 700 miles west of Sierra Leone. In the same area, the Italian sub TAZZOLI sinks the Norwegian tanker ALFRED OLSEN. ETO - UK: Day 246 of 258 of the Blitz. Aside from 507 bombers dropping on London, Liverpool and Belfast, Clydeside and Humberside are also hit. MTO - Malta: The British transport ship EMPIRE SONG hits two mines and sinks off Malta. MTO - Libya: Day 30 of 256 of the Siege of Tobruk. German intelligence intercepts a British radio transmission containing weather information in the Libyan-Egyptian border region. This tips them off that an offensive is about to begin there. Middle East: Day 8 of 30 of the Anglo-Iraqi War in Iraq. A British Brigade moves across the Iraqi border from Palestine. East Africa: Day 334 of 537 of Italy's East African campaign in the lands south of Egypt. CBI - China: Day 1,403 of 2,987 of the 2nd Sino-Japanese War. Day 3 of 21 of the Battle of South Shanxi. CBI - Thailand: Day 221 of 221 of the Franco-Thai War (Vichy France vs Thailand). A peace treaty is signed between Vichy France and Thailand, which gives back portions of Indochina that had been lost by Thailand 40 years earlier. Atlantic: Day 116 of 169 of Germany's Second "Happy Time," during which U-boats sink 609 Allied ships with little risk. US Coast Guard Cutter ICARUS sinks U-352 east of Wilmington, North Carolina. Russian Front - North: Day 244 of 872 of the Siege of Leningrad. Russian Front - North: Day 91 of 102 of the Battle of the Demyansk Pocket, another failed attempt to break the siege at Leningrad. Russian Front - North: Day 5 of 658 of the Siege of the Kholm Pocket. Russian Front - South: Day 192 of 248 of the Siege of Sevastopol, Crimean Peninsula. Russian Front - South: Day 2 of 12 of the Battle of the Kerch Peninsula, Crimea. East Africa: Day 5 of 186 of the Battle of Madagascar. CBI - Burma: Day 147 of 164 of Japan's Invasion of Burma. By this date, most troops of the Burma Corps have withdrawn west of the Chindwin River. US 10th Air Force B-17s night bomb Mingaladon and attack the docks at Rangoon. CBI - China: Day 1,768 of 2,987 of the 2nd Sino-Japanese War. PTO - Malaya: Day 80 of 357 of the Battle of Timor Island. PTO - New Guinea: US 5th Air Force B-26s and a B-17 attack shipping and seaplanes at Deboyne Island. ETO - UK: The British capture a JU-88R night fighter containing working FUG-202 Lichtenstein radar interception equipment. ETO - Netherlands: The German occupation government in The Netherlands declares martial law. Russian Front - North: Day 609 of 872 of the Siege of Leningrad. Russian Front - North: Day 370 of 658 of the Siege of the Kholm Pocket. Russian Front - South: The entire community at Skalat, Ukraine, is wiped out by the Germans. MTO - Tunisia: Day 174 of 178 of the Battle of Tunisia. The Axis troops at Tunis surrender. RAF and US Air Forces provide air support. MTO - Italy: US 9th and 12th Air Forces bomb at Palermo and the harbor at Messina. MTO - Sardinia: US 12th Air Force RAF Wellingtons bomb the airfields at Villacidro, Elmas and Decimomannu. CBI - China: Day 2,133 of 2,987 of the 2nd Sino-Japanese War. The Japanese begin a three-day massacre of civilians in Changjiao in the Hunan Province, killing about 30,000 people. PTO - Alaska: Day 337 of 435 of the Battle of Kiska, Aleutian Islands. PTO - New Guinea: Day 18 of 148 of the 2nd Battle of Lae-Salamaua. 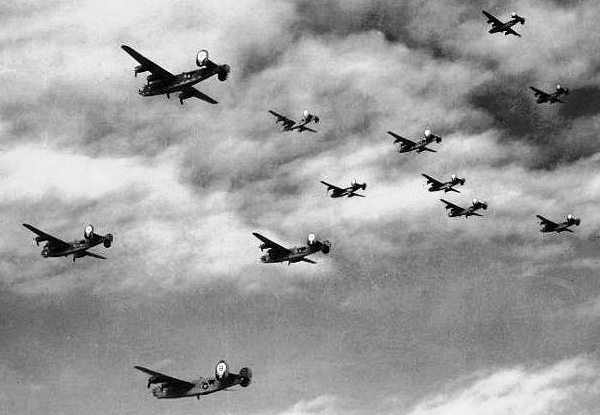 US 5th and 13th Air Forces provide air support. PTO - Philippines: The USS GAR sinks the Japanese freighter ASO MARU south of Negros Island. ETO - UK: Commanding General of the 2nd AD of the 8th AF, James P Hodges, sends the 492nd Bomb Group to do a low-level exhibition flight over the bases of his other 13 groups and orders all available men to stand outside and marvel at just how tight a formation can and should be. ETO: US 8th Air Force B-17s and B-24s bomb marshalling yards and airfields in France, Belgium and Luxembourg in preparation for the D-Day invasion. ETO - France: 108 prisoners of the Pithiviers Transit Camp are sent to La Rochelle to build fortifications at the mouth of the Gironde River on the Atlantic coast. ETO: - France US 9th Air Force B-26s attack marshalling yards, railway batteries, coastal defense batteries, bridges, and V-weapon sites. Russian Front - North: Day 98 of 191 of the Battle of the Narva Isthmus, Estonia. Both German and Soviet troops remain in their defensive positions. Russian Front - South: Day 32 of 35 of the Battle of the Crimea. Soviet troops recapture Sevastopol, Ukraine. Hitler orders his troops to withdraw. Russian Front - South: Day 32 of 60 of the Battle of Romania, 1st Jassy Offensive. MTO - Italy: Day 114 of 123 of the Battle of Monte Cassino. RAF and US Air Forces provide air support. The German Gustav Line continues getting weaker. MTO - Italy: Day 109 of 136 of the Battle of Anzio. RAF and US Air Forces provide air support. CBI - Burma: Day 66 of 166 of the UK's Operation THURSDAY. CBI - Burma: Day 61 of 147 of the Battle of Myitkyina. US 10th Air Force provides air support. CBI - Burma: Day 39 of 302 of the Chinese Salween Offensive. US 14th Air Force provides air support. CBI - China: Day 2,499 of 2,987 of the 2nd Sino-Japanese War. Day 23 of 259 of Japan's Operation ICHI-GO. Day 23 of 39 of the Battle of Central Henan, the first offensive in Japan's Operation ICHI-GO. Chinese troops are getting pushed out of central China. CBI - India: Day 63 of 118 of the Battle of Imphal-Kohima. PTO - New Guinea: Day 71 of 80 of the Battle of the Admiralty Islands. 5th Air Force provides air support. PTO - New Guinea: Day 147 of 597 of the Battle of New Britain. US 13th Air Force provides air support. PTO - New Guinea: Day 18 of 481 of the Battle of Western New Guinea. PTO - Solomon Islands: Day 191 of 295 of the Battle of the Bougainville Islands. US 13th Air Force provides air support. USA: The United States lifts its war time ban on horse racing. Atlantic: The German cruiser PRINZ EUGEN surrenders to the Allied forces in Copenhagen, Denmark. ETO - Norway: Josef Turboven, the German Reich Commissar for Norway, commits suicide in Oslo. Vidkun Quisling, Norway's pro-Nazi Prime Minister, is captured by the underground. ETO - France: The German defender besieged at Dunkirk finally surrender. ETO - France: Day 284 of 284 of the Battle of Brittany. The German garrisons at Lorient, St Nazaire and La Rochelle surrender. It will take a few more days for the rest of these German defenders to surrender. ETO - UK: The German garrison in the Channel Islands agrees to surrender to British troops after five years of occupation. ETO - Bavaria: Field Marshal Hermann Goering surrenders to US troops along with his wife, children and staff. ETO - Austria: Field Marshal Albert Kesselring is captured by US troops at the village of Saalfelden. Russian Front - Center: The German defenders in the Courland Pocket in Latvia, surrender. Russian Front - Center: Soviet troops capture the Stutthof Concentration Camp near Danzig (now Gdansk, Poland). Russian Front - Center: Day 4 of 6 of the Battle of Prague. Soviet troops enter the city. MTO - Greece: German garrisons (about 20,000 men) in the Greek islands surrender. CBI - Burma: Day 95 of 99 of the Battle of Pakokku and Irrawaddy River operations in central Burma. CBI - China: Day 2,864 of 2,987 of the 2nd Sino-Japanese War. Day 39 of 91 of the Battle of Zhijiang. US 14th Air Force provides air support. Day 31 of 60 of the Battle of West Hunan (near Zhijiang). Japanese troops continue withdrawing from southern China. PTO - Alaska: US 11th Air Force bombs enemy shipping between Paramushiru and Shimushu Islands. PTO - Caroline Islands: US 7th Air Force bombs airfields, barracks, and targets of opportunity on Param and Moen Islands in Truk Atoll. PTO - Dutch East Indies: Day 9 of 52 of the Battle of Tarakan Island. PTO - Japan: Day 39 of 83 of the Battle of Okinawa. The Japanese begin strapping on explosives, turning themselves into human bombs. Japanese kamikazes damage two destroyer escorts. PTO - New Guinea: Day 499 of 597 of the Battle of New Britain. US 10th Air Force provides air support. PTO - New Guinea: Day 383 of 481 of the Battle of Western New Guinea. US 10th Air Force provides air support. PTO - Philippines: Day 202 of 299 of the 2nd Battle of the Philippines, aka the Liberation of the Philippines or the Philippines Campaign. PTO - Philippines: Day 146 of 244 of the Battle of Luzon. 5th Air Force provides air support. PTO - Philippines: Day 61 of 159 of the Battle of Mindanao Island. 5th Air Force provides air support. PTO - Philippines: Day 53 of 135 of the Battle of the Visayas region. US 5th and 7th Air Forces provide air support. Churchill called the cracking of the German Enigma Code "the secret weapon that won the war." This photograph was published in Life in 1945 with the caption, "In New York's Times Square a white-clad girl clutches her purse and skirt as an uninhibited sailor plants his lips squarely on hers." The eleven fictional stories in this remarkable collection are based on real women whose experiences were at once typical and extraordinary.